For optimal lightening spritz on wet hair, then use a curling wand or flat iron after blow drying. This hair lightening spray brightens blonde hues by up to two shades. Expertly formulated with a blend of chamomile and citrus. Get a lighter blonde that feels as good as it looks. Formulated with citrus and chamomile, this shampoo renews blonde hair so you can go lighter without drying hair out. Safe for use on natural or colour-treated hair and for use on highlights & lowlights. You will receive 2 shampoo's and 2 conditioners.each are 2 fl oz. This is John Frieda Sheer Blonde Go Blonder Lightening Shampoo. Gradually lightens for sunlit blonde. Citrus lightening complex and chamomile, gently lighten appearance of blonde for a lighter, brighter blonde all year long. Improved formulas gradually lighten appearance of blonde, for natural-looking sunlit blonde year round. 3 John Frieda Go Blonder Shampoo, Conditioner & Spray. Condition is New. You get a 1 oz spray, a 2 oz shampoo and a 2 oz conditioner. These gradually lighten blonde hair. Sheer Blonde Go Blonder Lightening Shampoo. Brighten blonde strands, year-round. This hair lightening shampoo gradually deposits yellow tones for blonder-looking hues. Natural Lightening Complex gently lightens blonde hair and is mild enough for daily use. This hair lightening spray brightens blonde hues by up to two shades. Expertly formulated with a blend of chamomile and citrus. Exclusive peroxide lightening formula gradually lightens radiant blonde tones after 3–5 uses. Hydrate and lighten for a lighter blonde. For all shades of natural, color-treated or highlighted blonde hair. Sheer Blonde Go Blonder Lightening Conditioner. After showering you spray this product throughout your clean, damp hair. Your hair is gradually lightened in 3 to 5 uses. 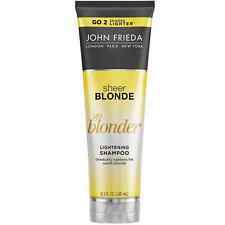 John Frieda Sheer Blond Go Blonder Lightening Spray 1 oz. 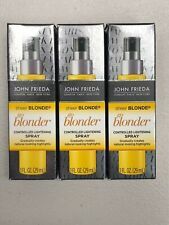 One New in Box John Frieda Go Blonder Lightening Spray 1 ounce. Quick Look : John Frieda Sheer Blonde Go Blonder Lightening Conditioner. Size : 2 fl oz (Travel Size). Sheer Blonde go blonder. JOHN FRIEDA. 2/3.5 FL OZ. BOXES MAY BE DENTED OR TORN BUT THE PRODUCT INSIDE. Must be used with John Frieda Sheer Blonde Go Blonder Lightening Shampoo to achieve lightening benefits. Formulated with bergamot extract and chamomile to gently lighten. Formulated with bergamot extract and chamomile to gently lighten. SHEER BLONDE GO BLONDER LIGHTENING CONDITIONER. JOHN FRIEDA. WITH CITRUS & CHAMOMILE. FOR ALL SHADES OF NATURAL, COLOR-TREATED OR HIGHLIGHTED BLONDE HAIR. GRADUALLY LIGHTENS BLONDE FOR AN ALL-OVER SUN-KISSED LOOK.